In the Capitulation of Erfurt on 16 October 1806 a large body of troops from the Kingdom of Prussia under Lieutenant General the Prince of Orange surrendered to Marshal Joachim Murat of France, at the city of Erfurt (now in Germany). The Prussian soldiers were demoralized by their shattering defeat at the Battle of Jena–Auerstedt on 14 October and unwilling to put up much resistance. The event occurred during the War of the Fourth Coalition, part of the Napoleonic Wars. Erfurt is located on the Gera River about 40 kilometers west of Jena. 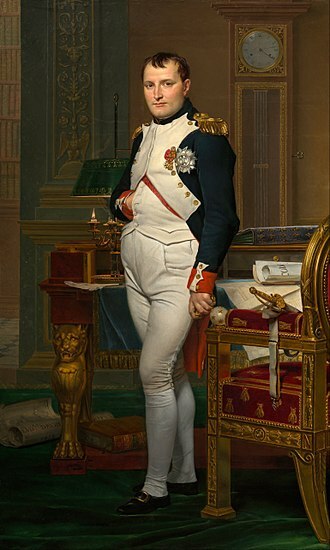 Only eight days before, Emperor Napoleon I of France invaded the Electorate of Saxony with a large army and quickly inflicted two minor setbacks on his enemies. This was followed by the catastrophe of 14 October. In the aftermath of the battle, the organization of the Prussian army disintegrated. Large numbers of Prussian fugitives from the battle entered Erfurt and could not be induced to leave. When Murat's French cavalry arrived before the city, it was surrendered without any fighting. At the beginning of October, three Prussian armies assembled in the Electorate of Saxony under Feldmarschall Charles William Ferdinand, Duke of Brunswick, General of Infantry Frederick Louis, Prince of Hohenlohe-Ingelfingen, and General of Infantry Ernst von Rüchel. Hohenlohe's army included 20,000 Saxons. In the center, Brunswick concentrated at Erfurt, Hohenlohe defended Rudolstadt in the east, and Rüchel held Gotha and Eisenach in the west. General Karl August, Grand Duke of Saxe-Weimar-Eisenach's division of Rüchel's right wing felt south toward the French line of communications. 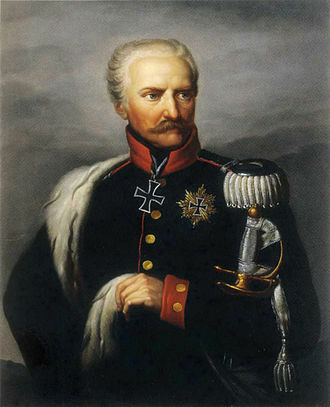 General Eugene Frederick Henry, Duke of Württemberg's Reserve lay far to the north at Magdeburg. On 8 October, Napoleon's 180,000 troops began crossing the Saxon border through the Franconian Forest. His troops formed in a batallion carré (battalion square) made up of three columns of two army corps each, plus the Cavalry Reserve, Imperial Guard, and some Bavarian allies. On 9 October, the French won the minor Battle of Schleiz. The next day, Marshal Jean Lannes' V Corps crushed the division of Prince Louis Ferdinand of Prussia at the Battle of Saalfeld, killing the young prince. 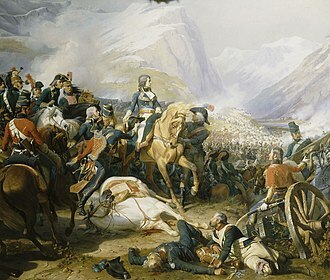 On 12 October, Napoleon ordered his army to make a left wheel to the west. The Prussian generals decided to retreat, using the Saale River to protect their flank. Brunswick marched the main army north from Weimar, while Hohenlohe stood on the defensive near Jena as a flank guard. Rüchel's orders were to stay at Weimar until Saxe-Weimar returned with his division. 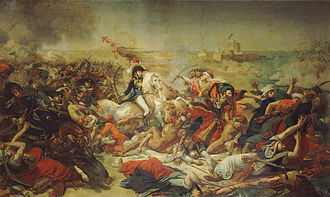 The double Battle of Jena-Auerstedt occurred on 14 October as Napoleon attacked Hohenlohe while Brunswick ran into Marshal Louis Davout's III Corps. The troops of Brunswick, Hohenlohe, and Rüchel were driven in rout from the two battlefields. Brunswick's army lost 13,000 men and its commander was mortally wounded. Hohenlohe and Rüchel suffered as many as 25,000 casualties. At 5:00 AM on 15 October, Napoleon began issuing orders to exploit his tremendous victory at Jena. He heard about Marshal Louis Davout's triumph at Auerstedt four hours later. Murat's Cavalry Reserve was split, with half directed to advance west to Erfurt and half northwest to Buttelstedt. 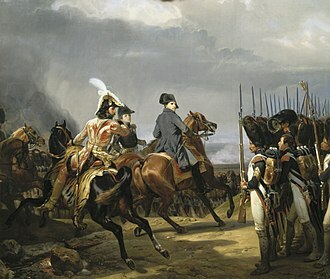 Napoleon sent Marshal Michel Ney's VI Corps toward Erfurt to back up Murat's horsemen, and ordered Marshal Nicolas Soult's IV Corps to Buttelstedt. The emperor instructed Marshal Jean-Baptiste Bernadotte's untouched I Corps to march to Bad Bibra north of Auerstedt so that he could prevent the fleeing Prussians from escaping east across the Elbe River. In consideration for the troops that had done the hardest fighting on the 14th, he allowed Marshal Jean Lannes' V Corps and Marshal Pierre Augereau's VII Corps to remain near Weimar and Davout's III Corps to march a short distance to Naumburg. 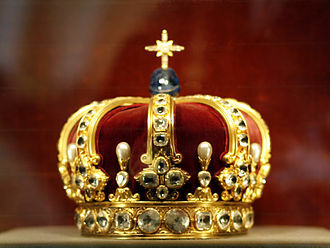 The Duke of Saxe-Weimar's division, which missed the 14 October battle, soon appeared west of Erfurt. Feldmarschall Wichard Joachim Heinrich von Möllendorf attempted to organize an orderly retreat from Erfurt northwest to Bad Langensalza, ordering Saxe-Weimar to cover the move. The wagon train was to lead the retreat, followed by the cavalry, then the infantry. Möllendorf, who had been wounded at Auerstedt, then collapsed and proved unable to carry out the operation. Another authority states that between 9,000 and 14,000 Prussian troops fell into French hands at the surrender. The number may include up to 8,000 wounded. At the time of the capitulation, Murat had about 16,000 troops near Erfurt. The 7,000 cavalry immediately available included General of Division Étienne Marie Antoine Champion de Nansouty's 1st Cuirassier Division, General of Division Jean-Joseph Ange d'Hautpoul's 2nd Cuirassier Division, and General of Division Marc Antoine de Beaumont's 3rd Dragoon Division. Erfurt's surrender permitted Napoleon to reroute his line of communication from Mainz on the Rhine's west bank, to Frankfort-on-the-Main, Eisenach, Gotha, and Erfurt. He abandoned the more circuitous route through Würzburg and Forchheim. After the surrender, Murat advanced to Langensalza with his three divisions but Saxe-Weimar was able to break contact. General of Division Louis Klein's 1st Dragoon Division, General of Division Louis Michel Antoine Sahuc's 4th Dragoon Division, and General of Brigade Antoine Lasalle's light cavalry pursued the Prussians farther to the east, near Weißensee and Buttelstedt. 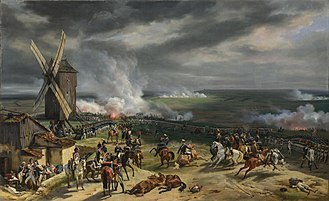 The Battle of Halle occurred on 17 October between Bernadotte's corps and Duke Eugene of Württemberg's Reserve. In the action, the French inflicted 5,000 casualties on the Reserve. Historian Francis Loraine Petre remarked that Erfurt was the first of a series of "pusillanimous capitulations" by Prussian fortress commanders. He wrote that Napoleon's plans might have been delayed if the city had held out for just a few days. Instead, the French emperor was able to immediately launch the entire army after his fleeing enemies. Eisenach is a town in Thuringia, Germany with 42,000 inhabitants, located 50 kilometres west of Erfurt,70 km southeast of Kassel and 150 km northeast of Frankfurt. It is the urban centre of western Thuringia and bordering northeastern Hessian regions. A major attraction is Wartburg castle, which has been a UNESCO world heritage site since 1999, Eisenach was an early capital of Thuringia in the 12th and 13th centuries. St. Elizabeth lived at the court of the Ludowingians here between 1211 and 1228, Martin Luther came to Eisenach and translated the Bible into German. In 1685, Johann Sebastian Bach was born here, during the early-modern period, Eisenach was a residence of the Ernestine Wettins and was visited by numerous representatives of Weimar classicism like Johann Wolfgang Goethe. 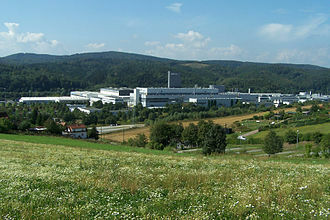 In 1869, the SDAP, one of the two precursors of the Social Democratic Party of Germany was founded in Eisenach, car production is an important industry in Eisenach. The Automobilwerk Eisenach was founded in 1896, in the German Democratic Republic, the Wartburg was produced here. Eisenach is situated on the Hörsel river, a tributary of the Werra between the Thuringian Forest in the south, the Hainich mountains in the north-east and the East Hesse Highlands in the north-west, Eisenachs origin and early history is unknown. An 8th century Frankish settlement near Petersberg hill is regarded as the nucleus of Eisenach, there are no written sources about that early period. According to legend, Louis the Springer began in 1067 to establish Wartburg castle above the settlement, in 1080, the castle was first mentioned in a Saxon chronicle. Eisenach itself followed in a document dating to 1150 where it was referred to as Isinacha, during the 1180s, the town was established by the construction of three independent market settlements around the Saturdays market, the Wednesdays market and the Mondays market. During the second half of the 12th century, the walls were erected and Eisenach got a planned grid of streets. In 1207, the legendary Sängerkrieg supposedly took place at Wartburg castle, in 1221, St. The so-called "Richtersche Villa" (Richters Mansion). 1805 portrait of Karl August, Duke of Saxe-Weimar. Engraving depicting Karl August walking with Corona Schröter and Johann Wolfgang von Goethe. Karl August as Grand Duke of Saxe-Weimar-Eisenach. The children of Karl August and Louise's: Charles Frederick, Caroline Louise and Bernhard. 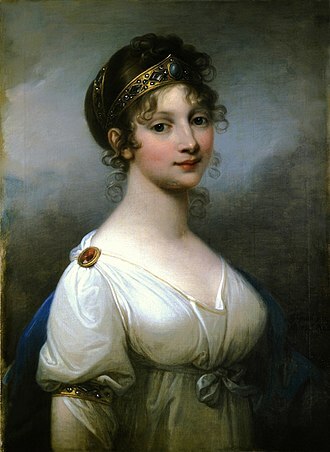 Portrait by Johann Friedrich August Tischbein, 1798.